Rocky Hollifield, president of Craggy Mountain Line. Rounding the bend on Woodfin Avenue, the spirit of the season is felt almost instantaneously upon arrival. It’s hard not to smile. Greetings of “Merry Christmas!” and carols sung by children — huddled together atop a restored 1950 Alexander Railroad Company No. 7 train engine — ring out, bringing a bit of sunshine to an otherwise dreary winter day. After climbing aboard a parked 1925 trolley, passengers are rewarded with sugar cookies and hot cocoa, sipping from their Styrofoam cups, shielded from the cold winter weather outside, while Bing Crosby serenades “White Christmas” from the speakers. 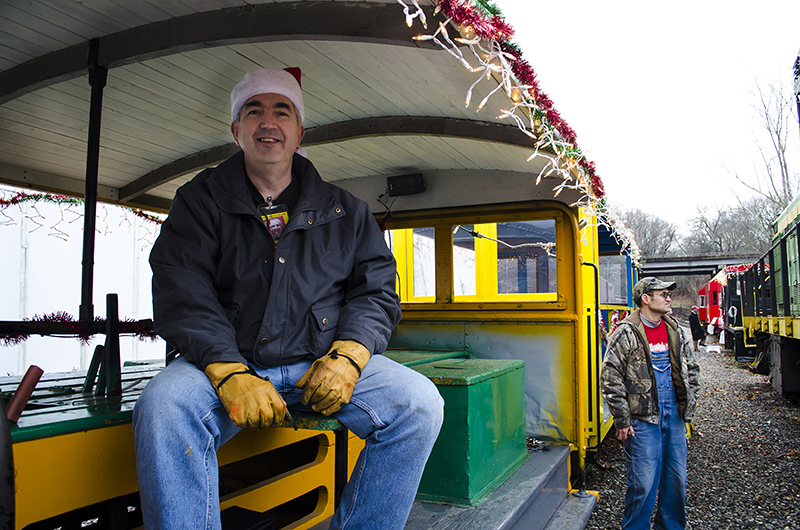 “I’ve always loved trains,” says Rocky Hollifield, president of Craggy Mountain Line. “That’s what I do. I live, eat, breathe and sleep trains. Craggy Mountain Line, a nonprofit dedicated to preserving a historic 3-mile stretch of track in North Asheville and Woodfin, does more than transport visitors down the track this holiday season: It gives regional residents a chance to embark on a journey reminiscent of scenes from Christmas classics of the past. “Honestly, the idea came from the song ‘Jingle Bells,’” Hollifield explains. “We’re an old-fashioned-type railroad. We’re trying to make you feel like you walked back into the 1940s. 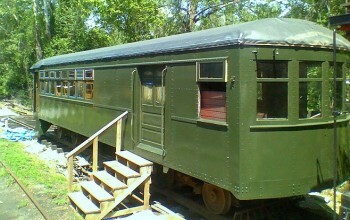 The open-car trolley ride already ran as an established seasonal weekend excursion at Craggy Mountain Line. So last December, Hollifield and his volunteers, inspired by the visual of a “one-horse open sleigh” ride, came up with the idea to make the open-car trip a bit more festive. “Last year we only ran one day,” Hollifield says. “We put it together, ran it all day long, and that was it — and we sold out. So this year, we decided to run it [every Saturday] starting after Thanksgiving. The nonprofit formed in 2001 and has big plans for the future, including the addition of a ticket office, restaurant, retail store and museum, all set to inhabit the various collected antique train and trolley cars. “It takes a lot of money to do this,” Hollifield said of his restoration work on the historic track. “So we formed a nonprofit and got the track, but it took a long time to get it. After that, we brought it to life. The train shouts a warning, and passengers climb out of the warm, parked trolley car, amble across the street, and climb aboard the two open-air cars on the opposite side of the road. Christmas lights and tinsel-garland swing from the roof as the 1927 Asheville streetcar begins to roll, and Hollifield waves goodbye from the sidelines with a smile. “We just started it last year, so it’s not to the point where it’s real profitable,” Hollifield says of the holiday ride. “But it does raise several thousand dollars for us, and all the money we get, from tickets and donations — whatever we do, is put right back into the railroad to make it grow. And it’s easy to see that lifelong passion in every tie on the historic track, as Hollifield and Craggy Mountain Line volunteers turn the original 1904 line into a functional railroad once again. 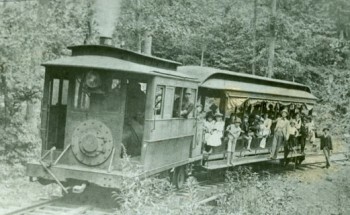 For more information about the Craggy Mountain Line or to get ticket information, call 828-808-4877.